Commence frantic internet searching for restaurant ideas. Now, I’m not knocking my dinner companions at all. I just hate that when someone mentions a restaurant, I read about one, or we pass one I don’t write it down for future reference. It would save so much trouble. Of course even if we do remember a place, it’s usually way too far out for all of us to meet since we all live in different parts of the metro Atlanta area and depending on the time of day or night it can easily take 30+ minutes to get anywhere. And that’s assuming I haven’t succumbed to the way of the slug and velcro-ed myself to the bed or couch. I found myself having a similar conversation this afternoon with my friend as we tried to decide where to meet for dinner. 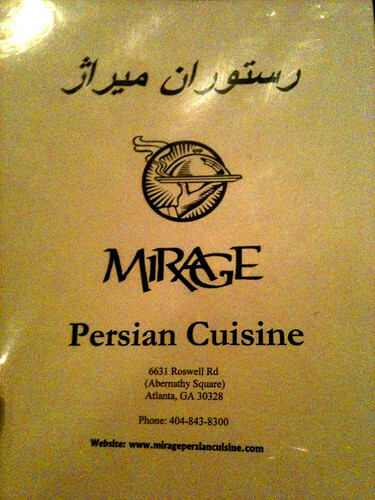 Just when we were about to settle for meeting at a chain-ish restaurant, I suggested Mirage Persian Cuisine, where we’d gone for my semi-surprise 30th birthday dinner in January. Wohoo, decision made, reservations made. There’s a whole string of Persian restaurants off Roswell Road in Sandy Springs and I fully intend to try them all. Since I was distracted during my birthday dinner by talking with everyone, I wasn’t really paying attention to my food at Mirage that night, so I figured tonight was a good opportunity to make amends. I apologize in advance for the pictures — I only had my iPhone on me and the lighting wasn’t the best inside. After drooling over the menu, we finally made our selections. Starting with the appetizers . 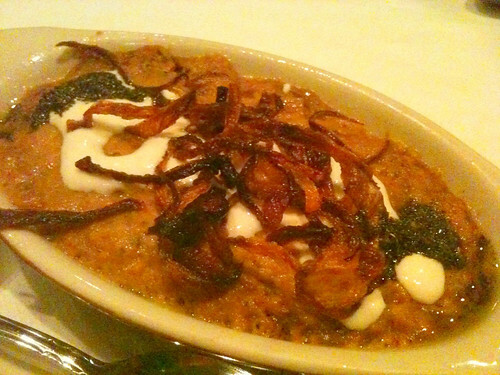 . .
Kash-O-Bademjan, which is an eggplant-based dip containing garlic, spices, herbs, sauteed onions, and cream of whey. It is NOT baba ghanoush. It is rich, creamy, and subtle. 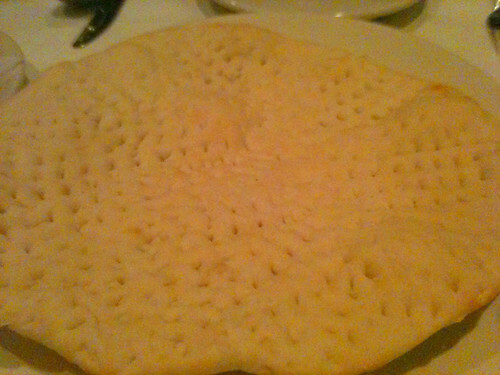 And goes so well with their bread, which is like a cross between pita bread and naan. 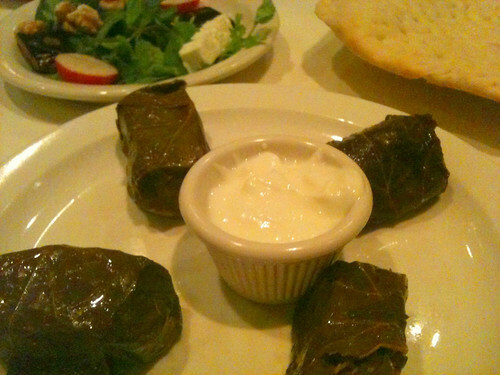 We also got dolmeh, which were grape leaves stuffed with rice, onions, and a sweet and tangy sauce. I’ve tried dolmeh a few times and don’t always like it, but I liked the ones here. Next, the entrees . 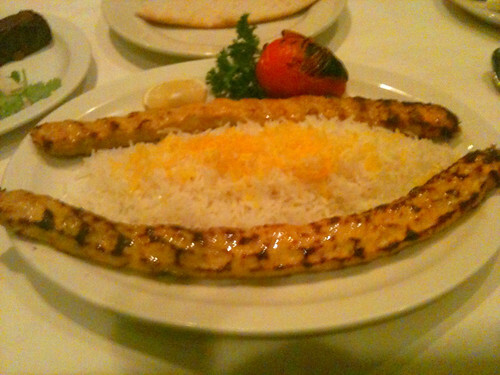 . .
Chicken Koubideh, which are ground chicken kebabs. Served with a heaping mound of Basmati rice. 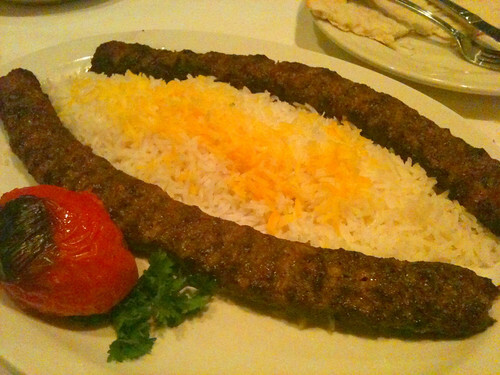 I got the Chelow Kabob Koubideh, which were basically the ground beef version of the Chicken Koubideh. Simple, but oh so good. Along with salt and pepper shakers, the tables at Mirage also come with ground sumac shakers. A few shakes adds a tart and tangy taste to whatever you’re eating, and it went really well with the kababs. I need to find a good Persian or Middle Eastern grocery store so I can get some. You didn’t think we’d skip dessert after eating all that, did you? Oh hell no. We decided to to try the baklava and the Persian ice cream. 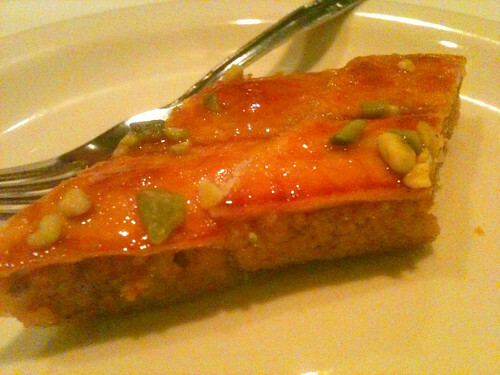 The baklava here tastes different than the kind served in Greek restaurants. I like this version better, it had a hint of cardamom that made it taste like Indian desserts. And it wasn’t drenched in sugary syrup, so it didn’t taste too heavy. I really like this new trend of serving desserts in those mini parfait cups. It’s such a perfect portion and allows you to try different things. This ice cream was sooo good. The top layer was redolent of rosewater and the bottom layer had a hint of saffron. 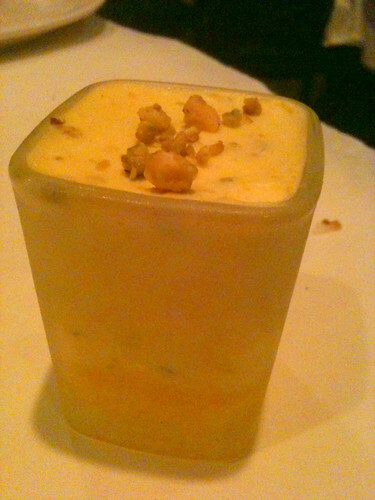 Think a Persian version of the Indian kulfi and you’ll have an idea of what this was like. These pictures do not do justice to the food, so the next time I go back I promise to take better ones. Oh yes, we will be going back. I really want to try Persian cuisine now! By the way, it was so great meeting you at FoodBuzz! Thanks for all the Indian cooking tips! Effectively, to start with, finest organic beef are created in such a way that there are no chemicals in the expanding approach or in the case of animals, the rearing process.